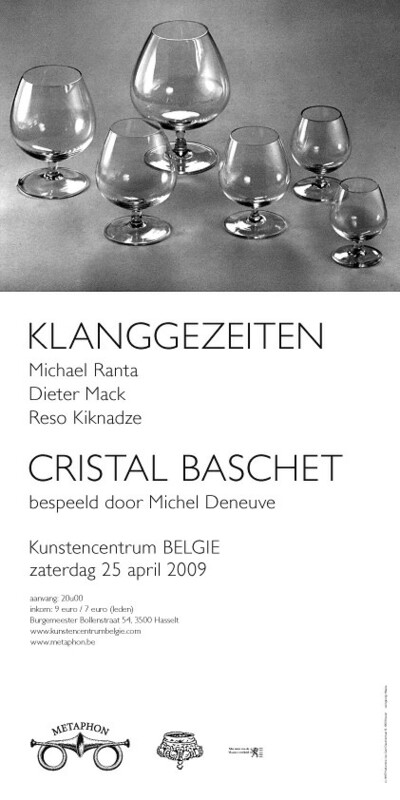 KLANGGEZEITEN is a trio of Michael Ranta (percussion), Dieter Mack (piano), Reso Kiknadze (live electronics). Percussionist Michael Ranta (US, 1942) is a key figure in the world of contemporary avantgarde music. He studied with a.o. Lejaren Hiller and Herbert Brün, recorded and performed in all Harry Partch productions between 1960 and 1968, worked in Europe with Lachenmann, Kagel, Stockhausen, Riedl… including a multi-media event for the Olympics in München, 1972. Moving to Asia in 1972 he taught music history and percussion. Meanwhile he performed with a.o. Takehisa Kosugi, Toshi Ichiyanagi, Toru Takemitsu and worked in the electronic music broadcast studio in Tokyo (NHK). He was also part of the legendary group ‘Wired’with Mike Lewis, Karl Heinz Böttner and Conny Plank (cfr. the great LP on the Deutsche Grammophon box set ‘Free Improvisation’.) Moving back to Germany in 1980 he formed the percussion group Transit, worked with Jean Claude Eloy and did numerous performances in Europe. Ranta won several prizes and released a couple of magnificent solo albums on his label Asian Sound Recordings and also provided music for theatre, dance and documentary film. In his works he brilliantly masters and balances the discipline of a composer, the freedom of an improvisor and the spirit of oriental tradition. Dieter Mack (Germany, 1954) is a composer/pianist and professor/musicologist. He studied with a.o. Klaus Huber, Brian Ferneyhough and taught and lectured in the far east. As composer he produced orchestral, chamber, choral, and piano works but also electroacoustic music. Mack has a deep interest in the gamelan of Southeast Asia, about which he has written extensively. His compositions fed by his rich background are of unusual structural and textural nature. They have been performed throughout Asia, Europe and North America .The Bärenreiter-Verlag published some of his earlier music, while his recent works are self-published. Mack has been performing with Ranta since the early 90’s. Since 2008 the duo Mack/Ranta is joined by composer/vocalist/saxophonist Reso Kiknadze (Georgia, 1960). Kiknadze studied composition under Michael Shugliashvili and Friedhelm Döhl, electroacoustic music under Dirk Reith and also Georgian traditional music. In 1991 he moves to Germany where he teaches at the electronic music studio in Lübeck. He regularly performs as saxophonist in various free jazz and contemporary music formations and apart from that he has also been involved in projects with artists from the dance, theatre, poetry and plastic arts scene. Kiknadze composed numerous pieces and won several prizes. The three share a classical background and are equally experienced in experimental improvisation, electronic music and the values of oriental tradition which inevitably will lead to surprising interactive music event accompanied by projection of meditative images created by Anila Ranta. He’s one of the first to have developed a refined playing technique, opening new horizons to this rather young instrument through a diversified repertoire of classical, contemporary and experimental music, solo and in ensemble settings. Deneuve performed worldwide with his unique instrument, he also provided music for dance, theatre, cinema and poetry. Several CD’s got released also including his own compositions. Metaphon coproduction with Kunstencentrum Belgie.